April | 2007 | . It’s Sunday afternoon and until 5 minutes ago I was in bed trying hard to have a restoring afternoon sleep. I forced myself to ignore airplanes, motorcycles, tv sets and a few other background noises but as I was about to fall to the other side, the ice cream van positioned itself outside my window and blasted its signature carillon-from-hell track. This put an end to my attempt to sleep and 5 minutes later here I am, with a cup of coffee, in front of the computer, typing the small chain of thoughts that the ice-cream-man initiated. It was about 5 years ago that I spoke with an ice-cream-van-woman, it happened at the Italian Consulate here in London. Visiting the Italian consulate is for me an enriching experience, it puts me in a place full of fellow Italians and all that I can appreciate that bonds us together is that we are all there to renew our passports. It’s just people, some are funky, some are plain, some are wealthy, some are poor, some are ghastly, some are great. There at the consulate all their being Italians resolves in being in the same queue. That’s all, there are no other signs of national character can be spotted as a clue to a common identity. In every country the Government and the media speak of national values and define this abstraction with some splendid examples of what it means to be ____________ (write here your national group). There’s always a battle to remember where soldiers were massacred but did so in good spirit, there’s some inventor of times past used to claim that all those with the same passport share his intelligence and there’s always some explorer that fulfills the role of the ambassador of our superior culture across the globe. That day at the Italian consulate I met this ubiquitous character, the ice-cream-van-lady. Ice-creams, as you probably know, are big in Italy and when I moved to London I was surprised to see how, with these noisy, smelly and awfully decorated vans, they are also a big hit in this country. So, when proposing national values, alongside explorers and generals, please, let’s have also the ice-cream-lady/man. This particular ice-cream-lady was a frail old woman, she sat next to me in the waiting room of the Consulate and started chatting. As Italian queues are traditionally unhurried I spent the next couple of hours listening to her. After a few minutes I realised that she had probably already started to lose the grip on her marble as she was confiding secrets that one would only tell to a very close person that you can blindly trust. A first feel of it came when she asked if I had any stolen goods to sell. “My husband has a junk-shop and knows some people that are always interested in helping young men in need of cash (wink)” she dropped at start of conversation. Then she told me all about her life and it was detailed and fascinating. Of particular interest was her ice-cream-van period and to explain the proper context of this enterprise of hers she said that “I could not get the licence for the van but then I cut a deal with the police, so they let me have the van as long as I told them everything I saw during my round”. Since then everytime I see (or hear) the ice-cream-van I think of her. And of her trans-national values. Searching the net on the keyword Lewisham I found this very funny page of Lewisham College’s website from December last year, Boris Johnson MP visits Lewisham College wearing his shadow minister for education hat, flirts with a 19 yo student and the school’s website writes all about it! Unless I read wrong. Same event from Boris’ own website. Much more serious take, no mention of flirting with students there. Am I a bad cat keeper? Bighead is one of the cats in my back garden, he’s always been free to live his life as he wishes but always chose to live beside us and spend quite a lot of time on the doorstep of our kitchen. I see his shape through the satined glass. He doesn’t ask much, just some food and a word of acknowledgment, ‘good-boy’ normally. Sometimes he lets me give him one stroke, on those occasions he makes a twirl and walks a few steps away to sit in some other spot, staring at me in a friendly sort of way. Quite often Bighead bears the marks of a fresh fight. I never get to know what happened to his opponents but I don’t think that Bighead is much of a fighter. I always just accepted this as a fact of life, he’s free, he lives his life to the full and pays the consequences. I see his wounds and only think of giving him some food leaving the healing job to nature. Unfortunately one wound to the neck got quite bad and today I had to call in the help of the good people of the Celia Hammond Trust. A couple of hours after they took him away I received a call from them “He’s knocked out now, he might need a skin graft.” they told me. They also told me that his neck had already been stitched up by some other vet. That came as a surprise. Some neighbour of mine must have brought him to a vet that patched him up, only that the wound became infected and it is now a putrid spot of skin that needs removing. They asked me if I had noticed him disappearing for a few days but no, I hadn’t, I realize now how little I have payed attention to his presence or absence, he may disappear for a few days, then when he’s back I still have food for him. At that moment a thought came. Has he been free or has he been not cared for (neglected)? He’s being cared for now, he’s also being neutered and that will help him keep alive and safe. I might have to adopt him for real now and keep him indoor for the rest of his life. No more unbound freedom for Bighead, but also no more risk of being killed in a street-fight. The campaign to assert the constitutional prerogative of the Area Forum to place items on the Executive Agenda of the London Borough of Lewisham has made it into the press. 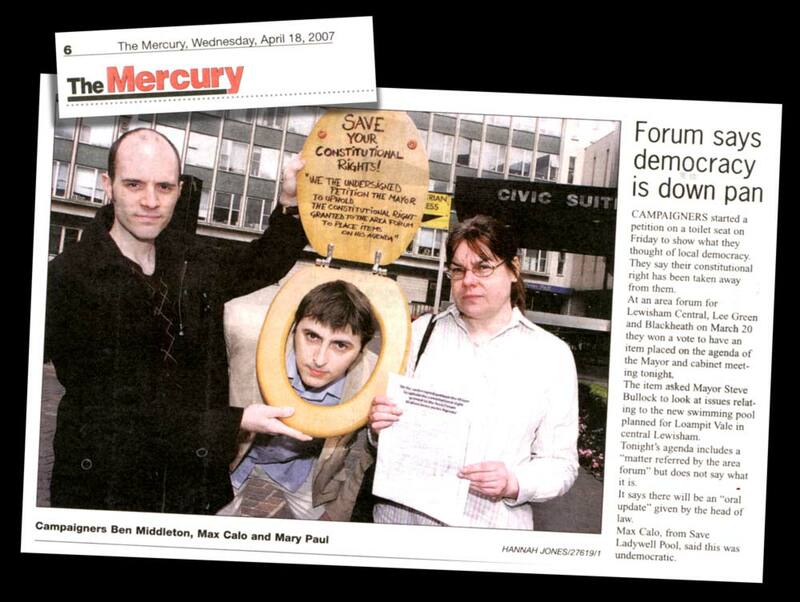 On Wednesday the local newspaper the Mercury published on page 6 a perfectly worded summary of the issue accompanied by a large photo of me peeping out of our campaigning toilet seat together with fellow campaigners Mary and Ben. But to give me even more joy the newspaper placed a teaser on the front page right under the title. And what a front page it is, the jolliest for years. Normally the headline would be about a terrible tragedy. This time it’s about a chap that did not get hurt at all in what could have been a terrible accident. Next there’s a report on a fancy dress competition for dogs. Above, my face is coming out of a toilet seat. The people of Lewisham this week is a smiling lot. The fair weather of these days surely plays a decisive part in the good mood, but a jolly front page delivered to each household maybe does help. And I’m on it. And proud of it. Yesterday I’ve been down to my local for the second Lewisham bloggers’ meetup. I think that I counted 12 bloggers, in no particular order there were Andrew (who organised, well done), Andrew, Bob, Tom Richard, Robert, Michael, Kate (with husband James), Adam, James, Wulf and me. Nobody took a laptop out of the bag but a few were taking photos, here’s Robert’s series. All lovely people and a lot of interesting conversations on all sorts of things. This was a (slightly) less political meeting than the first one (at least at my end of the table). As the pints rolled in I praised the architectural baldness of Milford Towers, heard that if you join second life you also get a virtual job there (no thanks), made some considerations on the institutionalization of local politicians, divulged confidential information and shamelessly tried to promote the toilet widget (Kate‘s got one now). Oh, we also spoke of blogging of course. Here’s my nomination for the most powerful use of the net today, it’s this week’s post by Beppe Grillo on his speech at the shareholders’ meeting of Telecom Italia. Watch it. Cheers to all those that came down to the Jolly Farmers, I look forward to the next one. Update: I have been told that there were 14 bloggers at the pub and not 12 as I previously erroneously estimated. David and Katy, aka Publicansdecoy and Obsessive Katy were also present at the symposium. That’s what I call empowering communities! I’m on a big fight these days. As usual the counterpart is Lewisham Council or better, a few of those at the top of it. The issue this time is bigger than the pool, it’s a constitutional matter. If you have been reading this blog or my campaigning blog you already know that about a month ago I attended my local Area Forum and proposed the residents intervened there to place an item in the Mayor and Cabinet Agenda as the Constitution of the London Borough of Lewisham allows Area Fora to do. Unfortunately, although we did something that the Constitution allows, we must now fight for this right to be respected because as you’d expect those in charge of the Town Hall are not at all happy with it. Now, I’m taking this seriously. This is a constitutional right and, it makes a lot of sense. Lewisham is one of the few Directly Elected Executive Mayor authorities in England and the way these Councils work is very simple. There’s the Mayor with all the power and the Council is more or less redundant. To make things even less democratic the Mayor only needs the vote of one third of the Council to approve the budget. I’ve been to quite a lot of Mayor and Cabinet meetings and they always remind me of King Solomon. Great, we have a system that to call medieval is to pay it a compliment. So, when you realize that the Constitution includes a small line of only two words (page 121) that makes it possible for the people of Lewisham to write items of the Mayor’s Agenda it all start to make sense. To write items on the Mayor’s Agenda means in effect telling the Mayor what he should do. Of course he can disagree, but to do so he must write down very clearly why he doesn’t want to do as you tell him to do. No more riddles, clear explanations. Because if those explanations don’t make sense or they’re untrue then you can challenge him with a Judicial Review and his opposition would take political advantage. Can you imagine if people really start to use this opportunity. All you have to do is prepare a document where you ask the Mayor to agree on an action (it’s for executive decisions), head for your Area Forum that meets once every year, propose a vote, make your case. If your neighbours think that you’re making sense the Mayor will find it in front of him/her and will have to think hard if to agree or disagree. Ever thought of something that the Council should do but doesn’t? Go on, write it down and look for your Area Forum. Are you member of a group that needs support from the Council? Tell the Mayor to give it to you. The sky is the limit. No, it’s the budget but there’s a lot of proposals that could make it. For what I know this feature of the Constitution has been there since we have this system and that was 2001. Have you ever heard of it? I haven’t. We’ve been flooded of a constant string of initiatives about empowering communities but nobody ever told us that we can tell the Mayor what to do next. That’s what I call empowering communities! And when a month ago I managed to place this item on the Mayor’s Agenda I felt empowered indeed. Only that of course the real world is a bit different because although the item has been placed there, now that the agenda has been published it’s just not there anymore. It’s been replaced by an oral update by the Council’s solicitor. I am not surprised that they fight back with the solicitors but as they should have known, I don’t take it sitting still and on Friday I was already campaigning. I started a petition that’s written on a toilet seat and with it I’m collecting signatures that I plan to deliver to the Mayor together with the toilet seat and the delivery is supposed to happen this coming Wednesday. That’ll teach him. It’s a metaphor for our rights flushed away and people seem to like it, lots of looks on the street and people stopping to listen. In fact I’m tempted to make this a longer campaign, it would also help inform people of this incredible right. Unless the Council’s magazine Lewisham Life decides to publish a feature to inform the residents of their rights. I lifted this image straight out of bldgblog for two reasons. The first reason is to flag today’s amazing interview with Walter Murch. 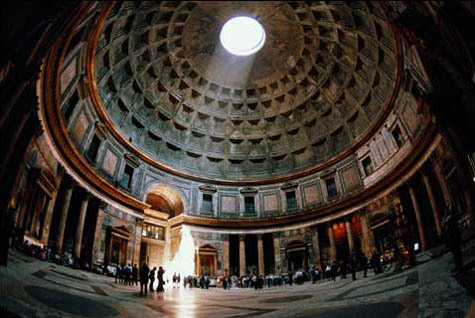 The second reason is that the Pantheon is my favourite ancient building in the world. Every time I’m in Rome I visit it and I find that being in a man-made space that it’s been in constant use for the best part of two thousand years adds some very useful depth to the sense of time that we normally live with. 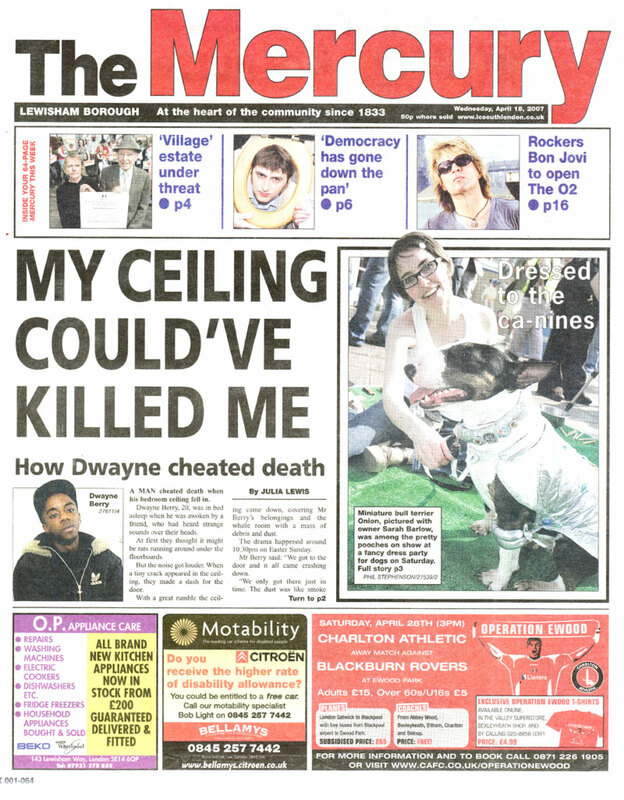 Is this the silliest newspaper title of all times? Can it be beaten? A few weeks ago the scart plugs on the back of my Widescreen Panasonic stopped working, first one, a couple of weeks later the other one gave up too. And this means no DVD but especially no Digital TV. Since then it’s been paradise. I have a lot more time available and my daughter is becoming seriously clever playing with those cubes with letters, numbers and pictures. Analog TV with its 5 channels is all we need to get by really. You read the programs and that takes only 5 minutes because there’s only 5 channels and not 500, then you discover that there’s something good for an hour in the evening and that’s when you switch the telly on and then you switch off. Perfect. Apart for those few programs that I watch on purpose I sometimes watch telly when I wash dishes, and for that purpose I watch the very old small Ferguson that’s in the kitchen that despite falling on the floor from high a number of times, just keeps on working perfectly. There I can watch all the most awful stuff. Last week I watched the Apprentice, I often watch Relocation, Relocation and if I have a lot of dishes to wash I can even watch Relocation, Relocation followed by Escape to the Country. Soon this self-harming pleasure will be taken away from me, you and everybody else with a small, old Ferguson in the kitchen. It is called switchover, but for all those trusty old sets it will really be their last switch off. This is in effect the greatest fly-tipping ever. Millions of useless TV sets dumped in millions of British kitchens. Any Radio 4 listener should be very worried. Mark Thompson wants to dumb down the BBC because the distasteful side of the BBC production makes more money than its quality counterpart. Still, we can draw some consolation by yet another evidence that Huxley was right.